AERIE SUNRISE HOUSE is an airy, spacious 1500 sq. ft. private getaway with the comforts of home. It is a short walk to Ganges village on beautiful Salt Spring, the largest of the Gulf Islands in the Pacific Northwest. We welcome our guests with a bottle of West Coast wine to enjoy in the cozy sunroom over looking the bamboo grove and fir trees or outside on the deck with a lovely view of the boats in the harbor and the Pacific Mountains in the distance. 2 baths. Relax in the unique cedar sun room and enjoy breakfast at the glass topped bamboo table. In the wintertime, the wood stove creates an ambiance that feels like a warm hug upon entering! Similarly the gorgeous 'Heatilator' fireplace in the living room makes for cozy evenings "where peace comes dropping slow" (from one of Yeat's poems). The dining room features seating for six for family dinners. The cupboards are full of unique casserole dishes created by various Salt Spring potters and there are many other lovely items for your use. There is even a Mix Master if you feel ambitious after picking blackberries and want to make a pie! Enjoy the new Smart TV and tune into Netflix or listen to your favorite You Tube music videos! Since we own an antique/collectibles store, you will find furnishings that are mid-century chic and vintage items throughout the house. Feel free to pound away on the piano. We were the founders of Erie Music in Southwestern Ontario that specialized in vintage instruments, and believe that music is part of the fun! Or perhaps you will enjoy playing several board games including Chess, Scrabble (special edition set that features a board that rotates for up to 6 players), Pictionary and many more. The Mid-Century Teak Suite in the second bedroom features a luxurious pillow top mattress and the master bedroom boasts fabulous '60's vintage dressers and bed frame. All artwork is original and most of the artists are Salt Spring based: Jill Louise Campbell (hallway ), Kay Caitlin (sunroom), Steven Patterson (dining room), Pat Wright (blue bath) and John Jaques from his "Spirit of Saltspring" exhibition (the fireplace). Other well known arts are Ontario watercolourist, Pat Fairhead, (entrance hall) and South African sculptor, Russell Morris (dining room buffet). You may be interested in watching the DVD - "Rivers of Time" about Andy Goldsworthy, the British environmental sculptor, on the DVD player in the entertainment centre. We live in an established neighborhood and people are quiet and respectful. There are dogs and cats who make their homes with humans but they are all living in fenced yards. We are less than a minute stroll from Bishop's Walk which affords some of the nicest views of Ganges and the harbor. This is where you will see the Ganges Trail that takes you into the village within 10 minutes. There is another connecting path that meanders through the woods and where you will often see and hear rare double horned Jacob sheep in the fields. When you reach Drake road you can cross and continue through beautiful paths in Mouat's Park (see photo). In July and August you will have many opportunities to pick luscious blackberries along the way. I enjoy providing quality accommodation to guests. Although I have been a teacher for many years, my current passion is buying and selling collectibles and antiques with my husband at our store in Victoria, British Columbia which is open 6 days/wk. Our suite is downstairs and we're quiet and quite private when we're home on Salt Spring. If you don't want contact with anyone, that's fine with us, although I love to greet you upon your arrival and show you your "home away from home". You will have lots of restful time. I am an experienced host and have another property with long term professional tenants who are wonderful people. Please let me know if there is anything that you need during your stay. Aerie Sunrise House is incredibly spacious, yet cozy with the woodstove in the sunroom and the fireplace in the living room. This custom designed home has been in our family since the 1970's and I remember hiking around the island on the many trails that still exist for all of you to enjoy. I provide a booklet that is now out of print and features all of the best places to give your hiking boots a good workout :) ! These paths are ranked easy, moderate and difficult. You will love the peace and quiet, summer and fall fresh air and winter musky smell of wood stoves as the ferry approaches Salt Spring Island. My guests have an exclusive offer on a 3-4 hr. sailing excursion! You receive a 10% discount off the price, for a magnificent must do experience. Join Captain Don Mellor aboard the sailboat L'Orenda for a casual sightseeing cruise through the calm waters of BC's Gulf Islands. Don's website is: www.lorenda.ca. The easygoing locals are always happy to share stories with you. There are many restaurants offering excellent fair trade, organic coffee. My favorite treat is 'Mocha Cafe' served up at 'Salt Spring Roasting Co.' made with organic Comino Chocolate and real whipped cream tightly swirled over the top!! I love the harbour views,the bamboo grove and the sweet family of deer that often wander through the gardens. The forest green carpeting in the living room reflects the outdoors. The sunroom with the vaulted cedar ceiling is a peaceful haven to curl up and read one of the many books I have selected... or maybe just to sit and watch the fire in the woodstove. Guests have many choices of board games and enjoy hours of fun in the warmth of this space! There is a Roland piano in the corner overlooking the bamboo grove where families gather to sing together and enjoy seasonal music using the songbooks provided. toilet, combination tub/shower, Equipped for senior adults with grab bars in/outside of tub. Bathroom 2 is an ensuite off the master bedroom with toilet and sink. You can walk to the ocean in the Village of Ganges. This takes about 10-15 mins. on the Ganges Trail close to the house. There are many walkways and spots to enjoy the ocean front. Beyond Ganges Harbor are the Pacific Northwest Mountains. These are always an uplifting sight. Lovely view of Ganges Harbor from the deck. It's especially enjoyable in the spring and summer months. Excellent wood stove in the cozy sunroom. Feels like a warm hug when it is lit in the winter months. Also , off the kitchen is the laundry room with washer /dryer. New 'Keurig Hot ' and I recycle the plastic pods. Even supplied with a Mix Master for baking. Many lovely pottery dishes and hot plates for buffets etc. etc. Very well equipped . Very n ice walnut dining table, buffet and china cabinet. SMART TV with NETFLIX feature. Shaw Cable has 40 music stations to choose from. Library of handpicked books: Fiction, Non-Fiction, Travel, Biographies. Please make sure to leave them in the BNB for other guests to enjoy. Thank you. Lots of fun board games: Scrabble, Pictionary, Trivial Pursuit, Chess and a series of contemporary games. See above. SMART TV has YOU TUBE . SHAW CABLE has 40 music stations. Roomy deck overlooking the harbour and gardens. Guests will enjoy the spaciousness of the rooms. The kitchen and dining rooms are full of casserole dishes and baking utensils. 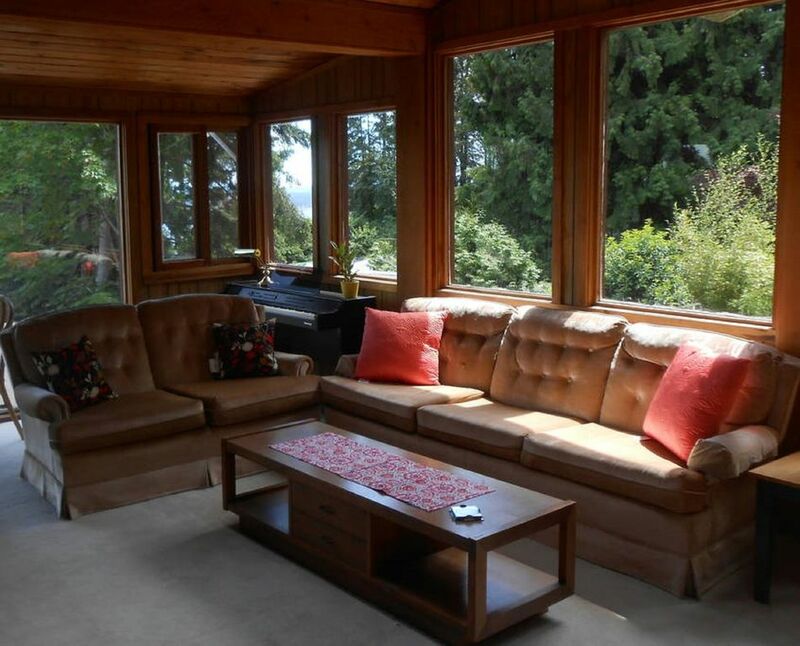 The vaulted cedar ceiling sunroom is cozy and pleasant in all seasons. This VRBO is lovely and the views from the windows and deck are spacious. The island is welcoming and lush. We enjoyed vineyards, goat cheese, hard cider and a distillery. Hikes and walks are abundant. Totally recommend this place! The house with the view. We had a wonderful time. The hostes was very friendly and accpmaditing. It is a spacious house but we spend it mostly in the cozy and charming sun room around the fireplace. It was difficult to leave. We will definitely come back. Thank you Sue.. I'm so glad that you had a lovely time with your family Marika. It was a great pleasure to host you. Your expressed gratitude over your stay was a joy to me! We enjoyed our stay. The house was very spacious and comfortable. It has a very well equipped kitchen. It was nice to be close to the town of Ganges. Our host dropped by a fresh bouquet of flowers. She was gracious and most helpful. This was a wonderful space to meet up with our dear friend for 5 nights. A wonderful home from home in which to experience the magic of Saltspring. Aerie Sunrise was a wonderful place to stay, very comfortable, full of character and in a great location. There were so many things we liked, from the very comfortable beds, the visiting deer and the beautiful sunroom - our favourite place to be. The best thing of all however, were our wonderful hosts Susan and John, they couldn't have been more helpful, welcoming and friendly; Susan certainly deserves her 'super host title. I am so happy that you and Pete enjoyed yourselves and were so comfortable in our bnb. The deer family were back in the afternoon and I'm sure that they were missing you both!! You were the absolutely perfect guests and I hope that other hosts have many opportunities to meet you. We're glad that you liked the sun room. It's also cozy in the wintertime when we get some snow and the wood stove provides a glowing warm fire. Thank you again for choosing our bnb. This is an incredibly spacious and beautiful property - lots of art and nature... You will have the chance to truly unwind and start reading that book that there never seems to be time for. Though very close to town, there’s a lot to do just in Aerie Sunrise itself: one can relax in the sunroom - with an amazing view of the harbor -, or take in the views on the balcony, watch the hummingbirds feed, and if one needs a fix of the outside world, Netflix is also available. It’s a truly lovely house and the owner, Susan, is also wonderful! Definitely hope to return - it’s a special place that can meet different interests, moods, and needs. Thank you Audrey for coming to spend your holiday with us again this summer. You are always such a wonderful, considerate and gracious person. You are a host's dream guest!! Please consider Aerie Sunrise House your "home away from home". I'm very happy that you had the chance to truly relax and regenerate.